As this was my first trip to USA, I had tough time choosing right mobile connectivity option. I had 3 choices. Activate and use international roaming on my existing postpaid number from Idea. Buy a USA SIM from here in India (so I can use it as soon as I land in USA). Buy a USA SIM from USA, once I reach there. Your existing number keep working so you don’t need to manage or give new number to people. Not much paperwork as most postpaid operator can activate it for some added security deposit and mostly without much paperwork. You will get coverage in many countries. Not only in USA. Unsolicited calls can make things tough. People from India can call you at odd hours. And if you are dealing with frauds like eBay, it can result in losses. As it’s postpaid, you can get a surprisingly higher bill. Especially if your data connection remain on. In my case, I activated international roaming on Idea and i-Roam USA pack from them. I landed in 3 different countries and Idea worked well everywhere. I did not get a surprise bill but I was also using option #3 in conjunction. So I used idea very rarely. I came across 3 providers for this and all of them are pathetic. They had very useless prepaid plans and a nice postpaid plan. The catch was they gets credit card details and Rs. 6000 pre-approved charge on it. They give you metered data plan. No automated way to stop it. Overall they seemed to be interested in selling postpaid plan only. I googled and found many complaints against them. Many users said that they received bills of tens of thousands INR when they returned. I always find anything from Reliance group hard to trust. They lived to their bad reputation this time as well. They have 2 prepaid offering – World SIM and USA SIM. USA SIM looks better choice. I contacted Reliance representative in Pune to enquire about it. Their representative told me that only World SIM is available. USA SIM are no longer on sell! His reply did not sound genuine so I contacted Mumbai representative and who told me that they can give me USA SIM in Mumbai. Mumbai representative charged me Rs. 4000/- and gave me a SIM. They were saying it’s AT&T USA SIM but it did not have any branding. The packing reminded me of people selling bottled water in previously used water bottle, without proper seal. 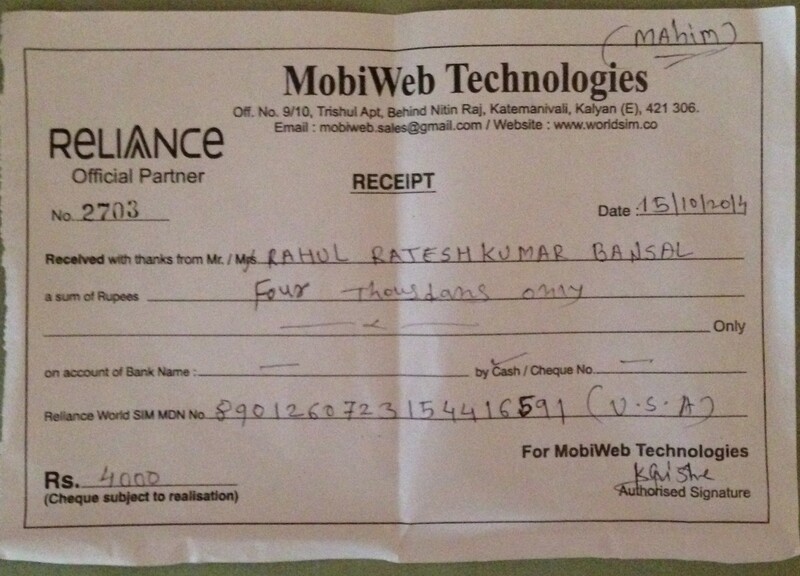 Reliance promised to activate it before I leave India and give me USA number. As expected, Reliance failed to activate my SIM in time. We had to call them like more than a dozen time to get it activated but it did not work. Overall they wasted my last day which I could have spent with my family! Refund experience was even more painful. My family called them behind me but they did not respond properly. I had to call them many times when I came back to India. After a lot of headache they refunded Rs. 3800/- saying Rs. 200/- deducted for “processing fees”. When I called for details about “processing fees”, the Reliance representative, Pramod Bhorse/MobiWeb, stopped picking my calls. When I called from other number they gave me excuses like “in meeting will call you later”. The call never came and I ended up donating Rs. 200/- to Ambanis! Charging customers without giving service is a common Reliance thing! I came across them 2 weeks before leaving through forums. I submitted enquiry through their website but nobody contacted me back. I suspect if the form was submitted at all or if the lead was recorded in a CRM or if they have any CRM at backend at all! They have broken website. I saw their counter on Mumbai Airport at the time of departure. They have many counters on Mumbai Airport. I saw one near airline counters from where you collect boarding pass. Another one at gate no. 69. By this time, I already had bad experience with Reliance and international roaming was activated on my regular Idea postpaid number. So I avoided giving this company chance. I anyway cannot trust a company who do not have a functional website! There are many options in USA for buying a prepaid SIM locally. Only problem with approach is When you land in USA, without any mobile-connection, you will need to use a pay-phone (I couldn’t notice any) or you need to borrow somebody’s phone to make a call. In my case, I had international roaming active so I did not face above problem. I had to make a call to my friend who was hosting me and I did it using my Idea number only. While waiting for shuttle, I used free wifi on airport to make skype to skype call to my family back home. I had some skype credit balance as well which I could have used to call friend’s mobile phone. My friend who shifted to USA recently recommend me Lyca Mobile. Other friends who are settled in USA many years ago never heard of Lyca! I heard some bad reviews on tripadvisor about their service so I did not order online. I walked into a local store and purchased SIM in USA only. My friend Nirav ordered online. He saved $10 and received both nano and micro SIM with free home delivery. $2.50 balance which I can use for things which are still chargeable. This balance went unused! Being from India, I was concerned about paperwork and activation process. Surprisingly, there was nothing. I purchased SIM like a chocolate and followed instructions and activated SIM with USA number in less than a minute. It was preactivated for real! Leave my idea postpaid number back home: My idea cellphone number is linked to bank accounts and pretty much everything related to rtCamp. So I will leave my main postpaid number back here. Closed family and friends will have my USA number, for others people picking my calls, will filter them and connect me whenever they feel appropriate. This will ensure that I can sleep peacefully in USA. Idea did not gave me shock this time but I cannot trust them forever as I am currently fighting with them for an overcharging incident for my mother’s mobile number. Load some skype credit: This will help you call landline and mobile phones from Skype whenever you are in wifi zone. US has wifi available at many places. Apart from this install facebook messenger and use FB-to-FB audio calls. Voice quality was better on facebook messenger but I guess facebook cannot be used to call landline and mobile phones. Buy a USA SIM in USA: Buy a local prepaid SIM in USA. It will be Lyca Mobile again for me. As long as Lyca remains awesome, I won’t be bothered to google for alternatives!